A pneumothorax occurs when free air accumulates in the pleural cavity between the visceral and parietal areas, and causes a portion or the complete lung to collapse. Pressure in the pleural space is normally less than that of atmospheric pressure but following a penetration injury, air can enter the cavity from the outside changing the pressure within the lung cavity and causing it to collapse. Air can also migrate to the area when the esophagus is perforated or a bronchus ruptures, leaking air into the mediastinum (pneumomediastinum). Barotrauma related to mechanical ventilatory support using high levels of PEEP leads to alveoli rupture and collapse. Gas formation from gas-forming organisms can also result in pneumothorax. Pneumothorax may occur spontaneously in cases where a subpleural bleb or emphysematous bulla ruptures due to chronic obstructive pulmonary disease, tuberculosis, cancer, or infection and this is the most common reason in otherwise healthy individuals. A tension pneumothorax is a life-threatening emergency and occurs when air is permitted into the pleural cavity but not allowed to escape, resulting in increased intrathoracic pressure and complete collapse of the lung. It compromises the opposite lung because of increasing pleural pressures and causes a mediastinal shift which interferes with ventilation and venous return. Severe shortness of breath, hypotension, and shock ensues, and emergent treatment of needle thoracentesis must be performed to relieve the pressure until a chest tube can be placed. A hemothorax occurs when the lung collapse is due to accumulation of blood. Blood accumulations usually occur from the pulmonary vasculature, the intercostal and internal mammary arteries, the mediastinum, the spleen or the liver. A hemothorax not only results in cardiopulmonary effects, but also may involve problems with hemorrhagic shock. The rate at which shock may occur depends on the source and rapidity of bleeding. 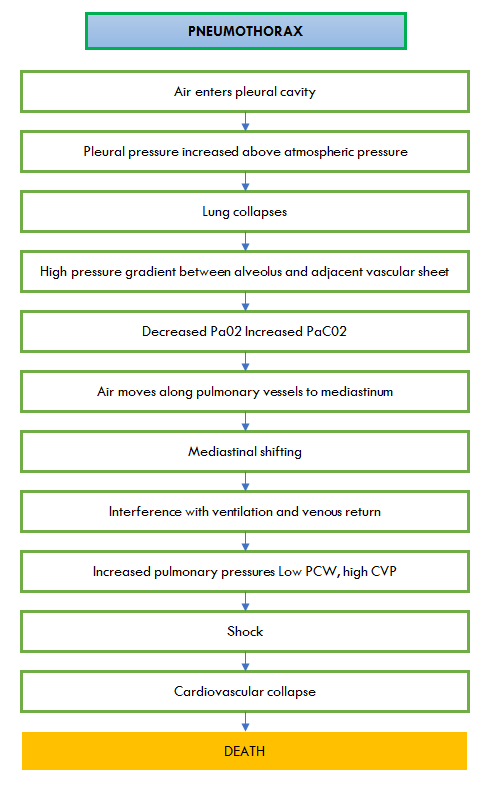 The severity of a pneumothorax, no matter what the origin, relates to the degree of collapse. A small partial pneumothorax may resolve by itself when the air is reabsorbed. In cases where collapse is more than 20-30 percent, a closed, water-seal drainage system and insertion of a chest tube via a lateral intercostal space is required. In cases where rapid re-expansion is desired, 15-25 cm H20 suction may be added to the drain system. A pneumothorax may result spontaneously or with trauma, such as a penetrating chest wound, gunshot wound, knife wound, or after a procedure such as insertion of a centrally placed venous catheter line. Some symptoms of pneumothorax include abrupt onset of pleuritic chest pain, shortness of breath, decreased or absent breath sounds, tachycardia, tachypnea, hyper resonant percussion, shock, and hypotension. Patient will be eupneic, with adequate oxygenation, and will maintain adequate ABGs. Monitor respiratory status for increase in rate, decrease in depth, dyspnea, or cyanosis. Physiologic changes that result from the lung collapse may cause respiratory distress and may lead to hypoxia. Breath sounds may be absent in areas where atelectasis occurs, and may be decreased with partially collapsed lung fields. Observe for symmetrical chest expansion. Moderate to severe pneumothorax will result in asymmetrical chest expansion until the lung is fully re-expanded. Observe for position of trachea. Tracheal deviation away from the affected lung occurs in tension pneumothorax. Listen for sucking sounds with inspiration; if present, apply occlusive dressing over wound while patient performs Valsalva maneuver. Indicates an open pneumothorax which impairs ventilation. During inspiration air moves into the pleural space and collapses lung; with expiration, air moves out of the pleural space. Application of a dressing seals the chest wall defect, while the valsalva maneuver helps to expand the lung. Observe for paradoxical movements of the chest during respiration; if present, stabilize the flail area with a sandbag or pressure dressing, and turn to the affected side. May indicate flail chest and impaired ventilation. Procedures help to stabilize the area to facilitate improved respiratory exchange. Place patient in semi-sitting position. Promotes lung expansion and improves ventilatory efforts. Prepare patient for and assist with insertion of chest tube. Intercostal tube placement is required when a pneumothorax is greater than 20-30% in order to facilitate re-expansion of the lung. Instruction, when feasible, reduces patient anxiety and improves cooperation. Once chest tube is inserted, ensure that connections are tightened and taped securely per hospital protocol. Prevents air leaks and disconnections at the connector sites. Monitor water-seal drainage bottles to ensure fluid level is above drain tube. Fluid must be maintained above the end of the tube to prevent air from being sucked into lung and resulting in further collapse. Maintain prescribed level of suction to drainage system. Usually 15-25 cm H2O pressure suction is sufficient to maintain intrapleural negative pressure and facilitate fluid drainage and re-expansion of the lung. Observe the water-seal drainage system for bubbling. Bubbling should occur during expiration and demonstrates that the pneumothorax is vented through the system. Bubbling should diminish and finally cease as the lung re-expands. If no bubbling is present in system, this may indicate either complete re-expansion of the lung or obstruction in the chest tube/drainage system. Monitor drainage system for continuous bubbling and ascertain if the problem is patient or system-centered. Clamp chest tube near the patient's chest. Continuous bubbling may result from a large pneumothorax or from air leaks in the drainage system. When the tube is clamped as described and bub- bling ceases, the problem is patient-centered with potential air leak at the insertion site or within the patient. If the bubbling continues, the leak is within the drainage system. If patient has insertion site air leak, apply vaseline-impregnated gauze around site, and reassess the problem. Provides a seal and corrects the air leak problem. If patient has drainage system air leak, ascertain the location by clamping the tube downward toward the system by increments. Secure connections. Determines the location of the problem and corrects air leaks at the connectors. Fluctuation of the fluid within the tubing, or tidaling, demonstrates pressure changes during inspiration and expiration, and is normally 2-10 cm during inspiration. Increases may occur during coughing or forceful expiration but continuous increases in tidaling may indicate a large pneumothorax or airway obstruction. Monitor fluid drainage for character and amount, and notify MD if drainage is greater than 100 cc/hr for more than 2 hours. Provides for prompt detection of hemorrhage and prompt intervention. Some drainage systems have the potential for autotransfusion, and this should be done per hospital policy. Strip chest tubes gently, if at all, per hospital protocol. Some facilities and physicians avoid milking, or stripping, of the tubes due to the potential for suction to draw lung tissue into the orifice of the tube and damage the tissue, as well as rupturing of small blood vessels. The procedure changes intrathoracic pressure which may result in chest pain or coughing. Stripping may be required to maintain drainage when large blood clots or fibrin strands are present or if the drainage is viscid or purulent. Place chest drainage system below the level of the chest, and coil tubing carefully to avoid kinking. Promotes drainage of air and fluid, and prevents kinking and occlusion of tubing. Identifies the presence of pneumothorax and resolution or deterioration. If chest tube is accidentally removed, apply vaseline-impregnated gauze and pressure dressing, and notify MD. Provides a seal over chest wound to prevent pneumothorax from recurring or worsening. Prompt treatment may prevent cardiopulmonary impairment. If chest tube becomes accidentally disconnected from tubing, reconnect as cleanly and quickly as possible. Disconnection may result in atmospheric air entering the pleural space and worsening or causing pneumothorax. Observe dressing over chest tube insertion site for drainage and notify MD for significant drainage. Excessive drainage on dressing may indicate malposition of the chest tube, infection, or other problem. Assure that chest tube clamps (2 for each tube) are present in patient's room and are taken with patient when transported out of unit. Provides for emergencies which may require clamping of the tube. Assist with removal of chest tube as warranted, and apply vaseline-impregnated gauze and dry sterile dressing over site, and change per hospital protocol. Once lung is re-expanded and fluid drainage has ceased, chest tubes are removed. Gauze provides a seal over the open wound to prevent recurrence of pneumothorax. Monitor patient for changes in respiratory status, oxygenation, chest pain, dyspnea, or presence of subcutaneous emphysema. May indicate recurrent pneumothorax and requires prompt intervention and reinsertion of intercostal tube. Instruct on function of chest tube/drainage system. Instruct patient to avoid pulling or lying on tubing. Prevents obstruction of tube and facilitates drainage. Instruct on signs/symptoms to report to nurse: dyspnea, chest pain, changes in sounds of bubbling from drainage system. Promotes prompt recognition of problems that may require prompt intervention. · Patient will be eupneic with no adventitious breath sounds. · Patient will have symmetrical chest expansion and midline tracheal placement with no episodes of dyspnea. · Patient will achieve and maintain re-expansion of lung with no recurrence or complications.